Calvin Coolidge was the 30th President of the United States who served in office from August 2, 1923 to March 4, 1929. What was the life of Calvin Coolidge like? The short biography of President Calvin Coolidge covers important information and facts about his early life, his family, career and the famous events and achievements of his political life. 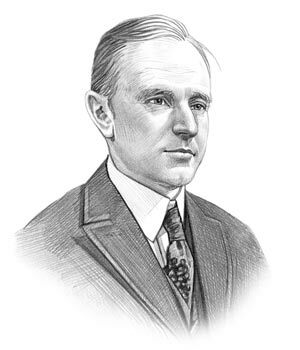 Our short biography of Calvin Coolidge provides an interesting and easy way to learn about the life of the President. The following important facts provide a fast overview of important facts about President Calvin Coolidge. Facts and Info: Calvin Coolidge was the 30th president of America during a period of economic prosperity. His policy was that government should interfere as little as possible with businesses and individuals and he therefore ignored signs that the stock market was likely to collapse. For additional info refer to 20 Facts about Calvin Coolidge. Facts and Info: He was born on July 4, 1872 in Plymouth Notch, Vermont. He was the son of a small-town merchant and was raised on the family farm. Calvin Coolidge died on January 5, 1933 at The Beeches, in Northampton. Facts and Info: The career of Calvin Coolidge included the roles of Lawyer, Politician and Statesman. He received a good education at Amherst College where he gained a reputation for his his public speaking skills. He became the 30th President of America in 1923 and served for 6 years until 1929. Facts and Info: Calvin Coolidge married Grace Anna Goodhue on October 4, 1905. Grace Coolidge, was a close friend of Helen Keller, the American author and political activist, who was deaf and blind. Calvin Coolidge and his wife had 2 children. Their names were John and Calvin. The family spoke in sign language when they did not wish to be overheard. Facts and Info: Calvin Coolidge belonged to the Republican Political Party. He was 51 years old when he was inaugurated as the 30th president. Inauguration is a President's swearing-in ceremony. Calvin Coolidge was sworn into office by his own father, who was a justice of the peace. He used the media well as "the most photographed person on earth." Charles Gates Dawes stood as the Vice President. For additional facts refer to his Presidential Cabinet members. Short Biography of Calvin Coolidge: What he was like! Facts and Info: Calvin Coolidge stood at 5 feet 10 inches tall and was slightly built. He had small deeply set blue eyes, and thin pursed lips. His red hair turned sandy as he aged. He was a man of simple tastes and known to be frugal and stoic. His nickname was “Silent Cal” due to his reputation for not saying much. He even refused to use the telephone whilst he was in office. Facts and Info: Coolidge's policies were aggressively pro-business. Coolidge secured reductions in taxes for wealthy Americans referred to as the "Coolidge Prosperity". Through his public statements he encouraged the reckless stock market speculation of the late 1920s and left the nation unprepared for the economic collapse and the Stock Market Crash that led to the Great Depression. During his lifetime he played a key role in important events of the era. Calvin Coolidge was instrumental in passing the Revenue Acts of 1924 and 1926 which decreased personal income tax rates and the Immigration Act. The Kellogg-Briand Pact renounced war as a solution to resolving international differences. During his presidency Charles Lindbergh made the historic, transatlantic flight in his monoplane, The Spirit of St. Louis. Facts and Info: Calvin Coolidge died of heart failure on January 5, 1933 at The Beeches, in Northampton. Instead of having the body taken to Washington or to Boston, to lie in state, Mrs. Coolidge ordered that her husband's body remain in their home. He was buried at Plymouth Notch, Vermont. The short biography of Calvin Coolidge provides a fast overview of the key facts and events about his life and the accomplishments of his presidential term in office. The following Calvin Coolidge video enables you to sit back and listen to the history of his personal and political life - a useful educational resource for kids, children and schools learning about the life of President Calvin Coolidge.